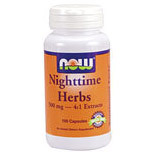 Nighttime Herbs – Herbal Formula for Nighttime Each serving of Nighttime Herbs is equivalent to 4000 mg of this select blend of herbs. Supplement Facts Serving Size: 2 Capsules Amount Per Serving % Daily Value Total Carbohydrate 570 mg <1% Valerian Root (Valeriana officinalis) (4:1 Powdered Extract) 400 mg Passion Flower (Passiflora incarnata) (4:1 Powdered Extract) 400 mg Hops (Humulus Iupulus) (strobiles) (4:1 Powdered Extract) 200 mg Suggested Use: As an herbal dietary supplement, take 2 Nighttime Herbs capsules 30-60 minutes before bedtime. Free of: sugar, salt, yeast, wheat, corn, soy, egg or milk Other Ingredients: Rice flour, silicon dioxide, and magnesium stearate Warnings: Because of the relaxing effects of this herb combination, do not drive or operate heavy machinery following use. This entry was posted on Tuesday, April 25th, 2006 at 12:02 am and is filed under Stress Relief. You can follow any responses to this entry through the RSS 2.0 feed. You can leave a response, or trackback from your own site.